Presently,it's all about Roald Dahl in Junior's world. It started with The Giraffe and the Pelly and Me and The Fantastic Fox. The collection is steadily building up. The lastest entry is Dirty Beasts.
" 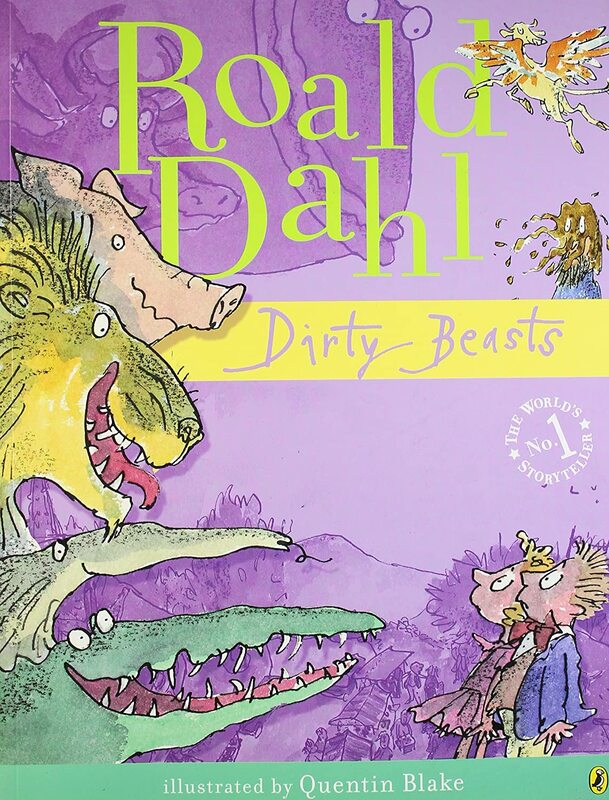 Roald Dahl has created a ghastly assortment of wicked beasts getting up to some extra ordinary and unmentionable things in this comic collection of verse. Meet the clever pig with a plan to save his bacon, the scorpion who likes to sting, the giant toad who can jump from England to France, and lots more." We had not read any of Roald Dahl's poems before. We were very excited. At bedtime, Junior and I took turns to read them aloud. We were rolling with laughter. The excellent illustration by Quentin Blake made the situations more comical. I would recommend it for children( 7 years +) who have read Roald Dahl books earlier and are familiar with his style and humor. Excellent for parent-child bonding actvity. Please read it aloud along with your children. The stories though dark, are clever, fast paced and full of action. You might find your little ones giggling and squirming with disgust at the same time. ( Some kids may not like the idea of an ant eater eating humans or crocodiles having boys and girls for lunch. But most 7 year olds I guess enjoy the yucky stuff :) ). The poems are lengthy, vary from 2 to 4 pages ( except The Lion). There are some sentences, which require careful handling and parental guidance. For instance, in The Cow,the reference to the man from Afganistan as horrid and cow dropping cow pat on his head. Also,The Scorpion, maynot be a good choice for bed time reading. It could be nightmare inducing. Are you sure, it is not a hare ? A vegetarian tiger ! it's a night mare. Such rumours are flying in the air. Next the lion wanted to cut his hair. He went and sat on the barber's chair. The other customers in the shop got a scare. They ran as fast as a hare. The barber shouted " Get up from the chair !" The sad lion went back to his lair.